Second Graders read this story during Art class in the computer lab. 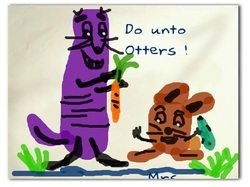 Using a creative website, www.artpad.com, students tried to paint their own otters, and tie them to the Bres "Bees" - Click on names below to see their work. Click on Ms. Jamison's image on the left to see her painting her picture! Please NOTE: this is a work in progress during the unit. Names will have links once the student completes the project.